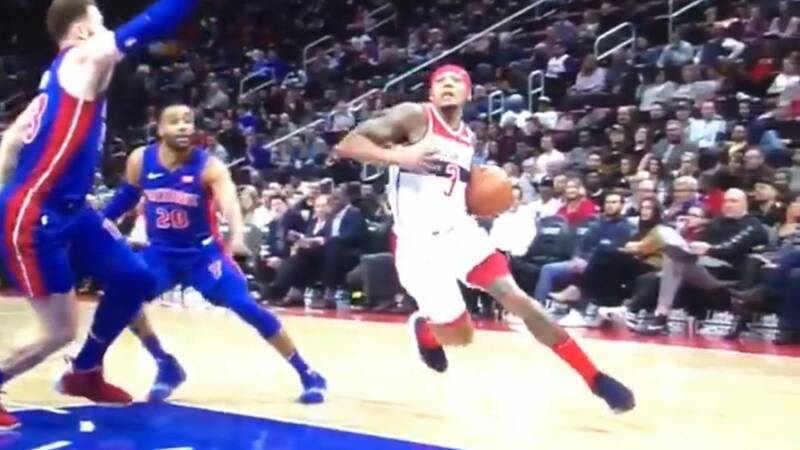 DETROIT - The official Twitter account of NBA referees went out of its way to justify a five-step travel that went uncalled against the Washington Wizards on Monday night at Little Caesars Arena in Detroit. The play in question happened with 7:16 left in the fourth quarter and the Detroit Pistons leading 102-88. Bradley Beal drove toward the basket with his left hand, took three steps around Blake Griffin, bobbled the ball, gathered it again, took two more steps and then threw the ball wildly back out to the right wing. No travel was called. In fact, a foul was called on Luke Kennard moments later for nudging Trevor Ariza out of bounds following the wild pass. "The offensive player gathers with his right foot on the ground. He then takes two legal steps, before losing control of the ball. After regaining possession, a player is allowed to regain his pivot foot and pass or shoot prior to that foot returning to the ground. This is legal." The account then tagged Sports Center, Jalen Rose, Yahoo Sports, SB Nation and others in a subsequent tweet. Are you familiar with the face palm emoji? This is a good time for the face palm emoji. The replies to the NBA referees' tweet are dominated by people who were, well, unconvinced. The play didn't really matter, as the Pistons still won the game 112-121. People were talking about the play, though, so the referees obviously wanted to chime in. There are good referees and bad referees, and both miss some calls. But really, come on, maybe just take the L on this one?